The TARDIS lands on a small, commercialized comet called Eight Slash Q Paneka, one on a path that makes it ideal for use as a cheap means of transportation, and one with a community crumbling at its very foundation. With thefts and disappearances commonplace, Nyssa and Tegan soon find themselves traversing the dangerous Unstable Zone while the Doctor and Turlough become embroiled in events that could threaten both Earth and Jupiter. Even though Nyssa’s rejuvenation to her younger appearance is almost completely ignored here, ‘The Jupiter Conjunction’ is the second story in a row that truly highlights the potential of this rather crowded TARDIS team. Splitting the leads up to experience different parts of the story is a trusted technique, but writer Eddie Robson employs it to great effect here. Importantly, even though Nyssa does now appear much younger, she retains the rational assertiveness that her years of experience have given her, in the process hinting that someone close to her may be suffering back home. Tegan being taken completely out of her depth and put in this hostile alien environment also tempers her usual sarcastic angst, and it’s fitting that she is so crucial to saving the day. Likewise, Robson makes great use of Turlough’s seemingly dubious morals as he betrays the Doctor for his freedom while constructing a very clever backstory to support his actions. There is a surprising amount of very clever ideas on display here, and the plot satisfyingly becomes much more complex than initially perceived as it progresses, involving Tegan in a very surprising way. Still, this very oppressed society where each action is subject to scrutiny and punishment and even saving a person’s life comes down to the financial bottom line is an effective setting, and the mystery of the TARDIS’s apparent role in a heist helps to create a very rewarding sense of tension as events and a trial unfold. At the same time, though, this is a tale about Earth and Jupiter, and Jupiter’s native Jovians are a brilliant creation, beings of dust and vapour cohesively held together by some underlying consciousness who- at the height of their power- could create a vast civilization simply with their minds. The lies being fed to them that Earth plans on turning Jupiter into a second sun may seem like an obvious ploy and perhaps raise questions about the powerful Jovians’ gullibility, but this intense core conflict plays out spectacularly as truths are slowly revealed from unexpected sources. 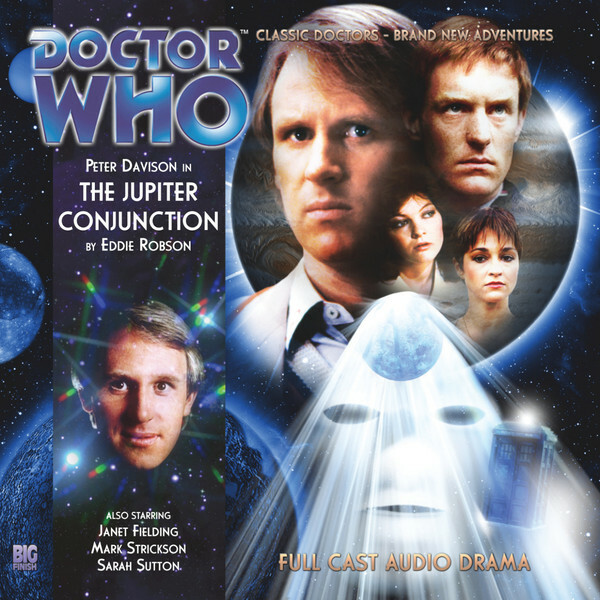 ‘The Jupiter Conjunction’ captures the feel of classic Doctor Who perfectly, creating a great sense of nostalgia while playing it relatively safe until a surprising fourth episode that completely changes the trajectory of the tale. All four leads are again utilized to great effect without anyone being forced into the background. Even if this does mean that the guest characters aren’t necessarily given as much opportunity to come to life and distinguish themselves and even despite the surprising oversight of mentioning Nyssa’s recent rejuvenation, ‘The Jupiter Conjunction’ is an exciting story with excellent pacing and plenty of intrigue, further strengthening the development of this old-but-new TARDIS foursome along the way.